Sophos Intercept X features CryptoGuard, which prevents the malicious spontaneous encryption of data by ransomware-even trusted files or processes that have been hijacked. And once ransomware gets intercepted, CryptoGuard reverts your files back to their safe states. You've been hit! How did it get in, where did it go, what else did it touch and-most importantly-what should you do now? We've got you covered. The unique technologies of Sophos Intercept X are designed to stop attackers before they have a chance to throw their first punch. Rather than examining hundreds of millions of known malware samples, Intercept instead focuses on the relatively small collection of techniques used to spread malware. This way, we can ward off zero-day attacks without having even seen them first. Along with Intercept X we provide a powerful virus cleaner. While most traditional virus cleaners simply remove offending malware files, Sophos Clean goes the extra mile by eradicating the malicious code and registry keys created by malware as well. It'll be like your machine was never infected in the first place. "ESG Lab found Sophos Intercept X to be simple enough for an IT generalist, while providing features and functionality advanced enough for the professional security analyst." The days of straightforward file scanning are long gone. Your goal is now to prevent threats from reaching your devices, stop them before they run, detect them if they have bypassed preventative methods, and not just clean up malware, but analyze and undo everything it does to your endpoints. Sophos Intercept X uses multiple layers of technology, allowing you to create your own tailored next-generation endpoint security solution. Anti-exploit technology stops threats before they become an issue by recognizing and blocking common malware delivery techniques, thus protecting your endpoints from unknown threats and zero-day vulnerabilities. CryptoGuard technology detects spontaneous malicious data encryption to stop ransomware in its tracks. Even if trusted files or processes are abused or hijacked, Sophos Endpoint Protection will stop and revert them without any interaction from users or IT support personnel. CryptoGuard works silently at the file system level, keeping track of remote computers and local processes that attempt to modify your documents and other files. Identifying malware and isolating and removing it solves the immediate problem. But do you really know what the malware did before it was removed, or how it was introduced in the first place? Root cause analysis shows you all the events that led up to a detection. You'll be able to understand what files, processes, and registry keys were touched by the malware and activate your advanced system clean to rewind time. 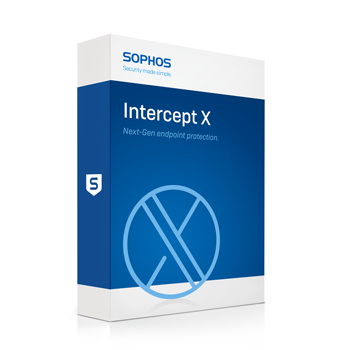 Sophos Intercept X compliments existing anti-malware and antivirus implementations delivering powerful next-gen anti-exploit and anti-ransomware protection traditional products lack. By eliminating the attack vectors which traditional solutions don't block, Sophos Intercept X helps to harden your security posture and increase resilience. Managing your security from Sophos Central means you no longer have to install or deploy servers to secure your endpoints. Sophos Central provides default policies and recommended configurations to ensure that you get the most effective protection from day one. Sophos Intercept X with Deep Learning from Sophos on Vimeo. Download the Intercept X Deep Learning Datasheet (PDF). Download the Intercept X & Central Endpoint Protection Overview (PDF). [Windows only]: Exploit Prevention, Sophos Clean.